Many days we have walked by a hotel and seen the beautiful (and expensive) cars decorated with flowers to celebrate a wedding. And when I say expensive, I am talking that a Porsche is the entry level with Bentleys and Rolls Royce being preferred–the bigger the car, the better the status. 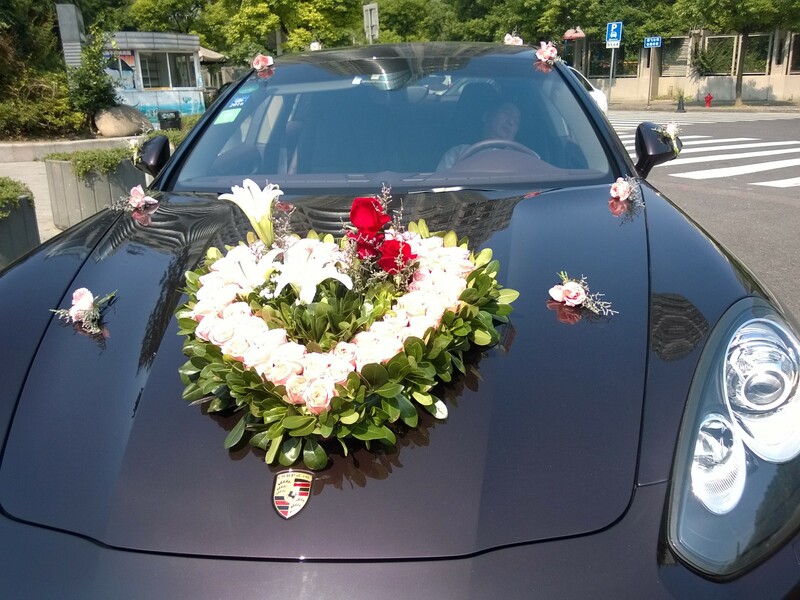 We walked by this lovely Porsche on a hot sunny day recently and admired it’s beauty until we saw the driver sawing logs reclined in the front seat and quietly snuck away so as not to disturb his beauty sleep–weddings will do that to you! The ritual seems to be that the bride/groom lead the wedding processional in the most elaborate car with a hood floral centerpiece with the wedding party cars decorated more discreetly with flowers on the side mirrors. Not having actually been invited to attend the inner sanctum of a wedding ceremony, I can only imagine how over the top the flowers are there if their gorgeous cars are any indication. As in the U.S., the ceremony might be nice, the food should be good but the pictures are everything. On weekends especially, if you go to The Bund or the parks, you will surely see the brides and grooms getting their pictures taken in picturesque settings, posing with their wedding party. This occurs sometimes months before or after the wedding or for their engagement party. The dresses are elaborate and gorgeous. No expenses spared for Chinese weddings! It seems like the river boats on the Huangpu River are rented out for weddings frequently. 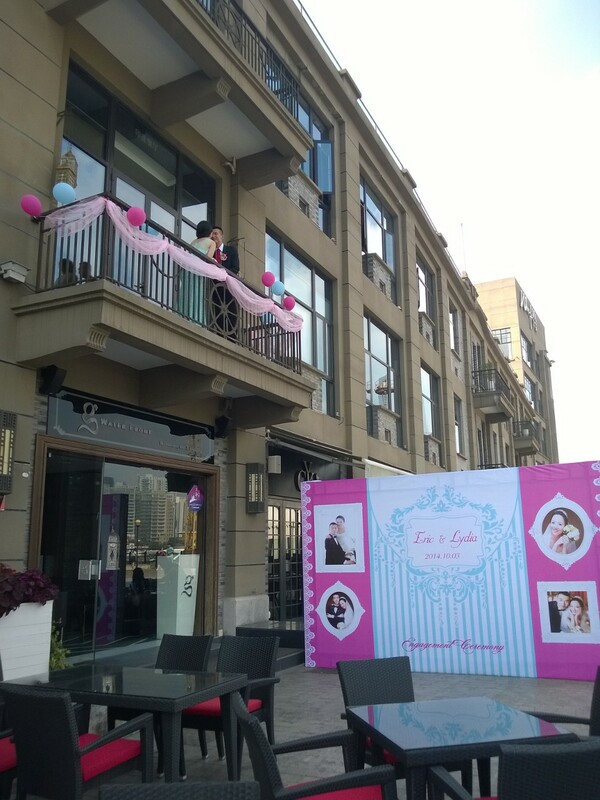 Typically, you will see a huge banner hanging on the side with portrait of the happy couple. Nothing like seeing yourself 12 feet tall and flapping in the breeze to celebrate the happy day. Can’t imagine what that sets back the parents paying for those parties. Yikes! We were at the Cool Docks recently and the center restaurant among the fountains had been decked out for a wedding in the evening. We didn’t stick around but I’m sure it was just beautiful. White cut out light cylinders indicated a night wedding with the formal chairs and runners all in white and very formal. Party on! 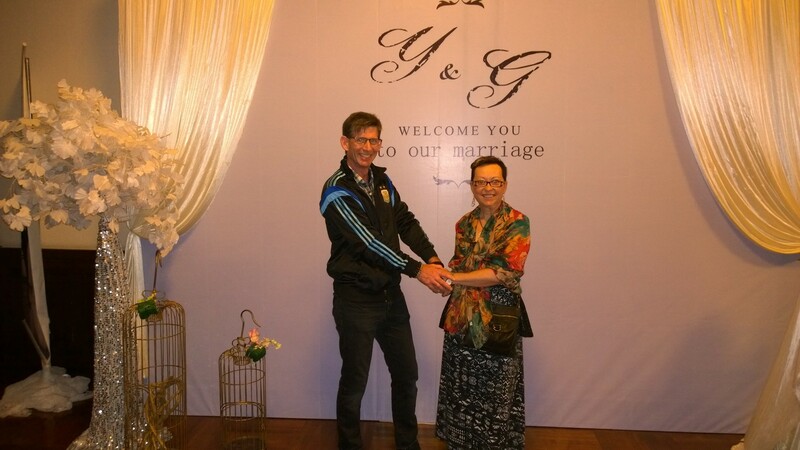 On another night as we were going to Shook bar on the Bund, we ran into, literally, a wedding party just breaking up. The flowers were everywhere and their backdrop banner provided Thom and I with an unique opportunity to “borrow” their props. Always the newlyweds we are!